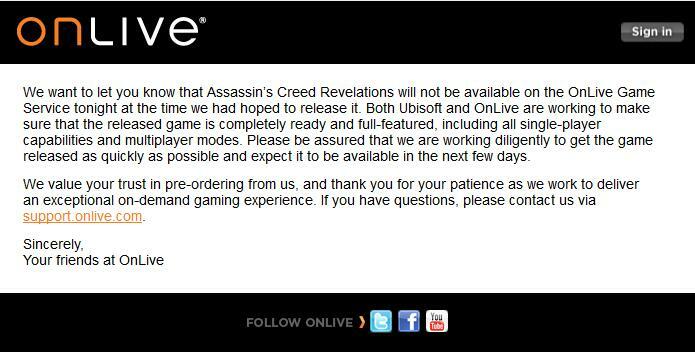 To the surprise of many US users of the OnLive cloud gaming service Assassin’s Creed: Revelations did not unlock as expected and instead changed itself to Coming Soon. With OnLive estimating only a few days delay, it appears they haven’t yet changed the date to release Assassin’s Creed: Revelations in the UK. This is still set for release on December 2nd. Afterfall: InSanity was another game said to be coming today and is also MIA. OnLive didn't say anything about it, probably because they haven't officially announced the release date. Fallout 2 and EDGE are this week's new additions to the PlayPack. The PlayPack now features 126 games and growing. Fallout 2 is the sequel to Fallout and also a RPG classic from the golden age of PC RPGs. The game is published by Interplay. This is game two of the Three Weeks of Fallout that OnLive announced. After Fallout and Fallout 2, Fallout Tactics is the last game to join the PlayPack next week. Sadly no Fallout 3 or Fallout: New Vegas yet, because those two are published by Bethesda. Let's hope that Interplay also brings more of their games like Earthworm Jim, Freespace, MDK, Sacrifice and Messiah to OnLive. In Fallout 2 it's been 80 long years since your ancestors trod across the wastelands. As you search for the Garden of Eden Creation Kit (G.E.C.K.) to save your primitive village, your path is strewn with crippling radiation, megalomaniac mutants, and a relentless stream of lies, deceit and treachery. You begin to wonder if anyone really stands to gain anything from this brave new world. You can play the free demo of Fallout 2 powered by OnLive. EDGE is an indie retro styled platformer developed by Two Tribes. The game features dozens of exciting platforming levels and a classic 8-bit inspired soundtrack. You can play the free demo of EDGE powered by OnLive. OnLive has announced that they have extended their $1/£1 first purchase promo through the day today in honor of Cyber Monday. The promotion allows any gamers to purchase their first game on the OnLive service for only $1 (US) or £1 (UK). This offer pertains to all the standalone PlayPass titles on the entire OnLive service, meaning Batman: Arkham City, Saints Row: The Third, LotR: War in the North, L.A. Noire and many other games can be purchased for only $1/£1. This promo was originally supposed to end at 12:01 AM PST/8:01 AM GMT today, but instead it has been extended until the end of the day today. On friday, OnLive announced that they had 4 mysterious Cyber Monday deals in store for everyone. Today is Cyber Monday and here are the 4 mystery deals for both the US and UK (although no official announcement has been made by OnLive as of yet). Some of the prices on the UK games don’t appear to reflect any sale as of yet. The prices below are the current (with sale) prices followed by the additional 30% off PlayPack price that PlayPack subscribers get. A national TV ad for OnLive was released in Northern Ireland. It is promoting the OnLive cloud gaming service as well as their partnership with British Telecommunications. 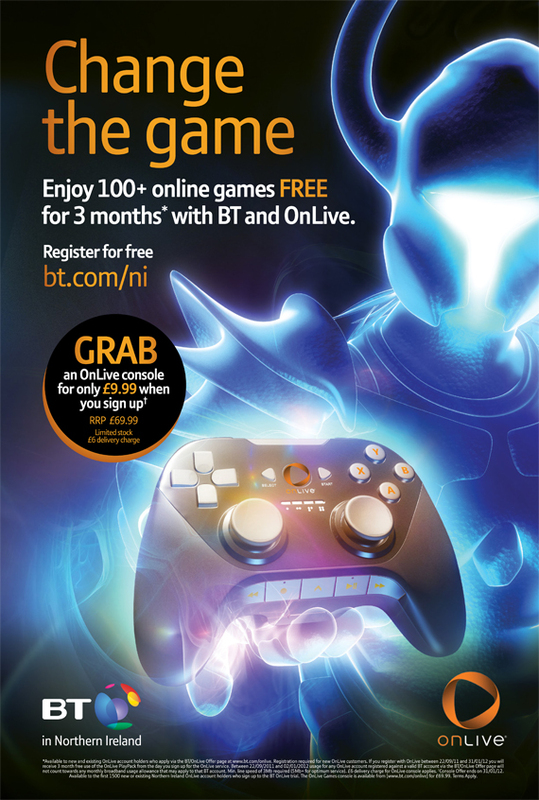 Northern Ireland gamers, like all UK members who have BT as their ISP can sign up for a 3-month free trial of the OnLive PlayPack, which includes a growing library of over 120 different games. Gamers in Northern Ireland and the UK, who are BT subscribers can play all of these games for 3-months, totally free of charge. If they wish to continue the service after the 3 months are up, they can do so for only £6.99/month. OnLive traffic will not count towards BT broadband customers usage allowances until the New Year, regardless of their broadband option. In addition to the 3 Free months, Northern Ireland gamers can purchase the OnLive Game System, which is normally priced at £69.99 for only £9.99 (Offer ends when all 1,500 OnLive Game Systems at the special offer price have been purchased or by midnight 31st January 2012 – whichever comes first). Check out the display ad for this promotion below, and be sure to watch the TV Ad. More information on these deals can be found at http://www.btnorthernireland.com/home/onlive. The OnLive Version of Afterfall: InSanity has been delayed until Tuesday, November 29. It was originally planned to release on Friday, November 25, but there have been some minor delays. OnLive announced today, that in addition to all of the current sales that they have going on, they will be announcing 4 more Cyber Monday deals via their Facebook page. These are in addition to all of the on-going sales that were announced yesterday. Currently OnLive is offering gamers their first game for only $1 (£1 UK). This includes titles such as Batman: Arkham City, Saint’s Row: The Third, L.A. Noire, and Lord of the Rings: War in the North. They also have over 35 games on sale in both the United States and the United Kingdom, which are discounted at up to 75% off. In addition to this, OnLive is also offering a FREE 5-day rental for Homefront and Red Faction: Armageddon, which can be redeemed up until Monday, November 28 at 12:01AM ET. Yesterday, we announced a huge Thanksgiving sale that OnLive was having for their 5 Day Frag Feast promotion. They announced sales on over 40 games in the US. However, UK gamers were not seeing discounts on most of the games that were being discounted for US members. As of early this morning in the UK, OnLive UK has put over 35 games for sale at prices up to 75% off. In addition, on top of these current sales, all gamers can purchase their first game on OnLive at only £1. This applies to any PlayPass games on the entire service, including Batman: Arkham City, Saints Row: The Third, LotR: War in the North, and many more. Don’t forget to also activate your 5 FREE days of Homefront and Red Faction: Armageddon! After a month long delay, Batman: Arkham City finally released on OnLive alongside the PC version of the game in the UK. Batman: Arkham City is priced at £34.99 and PlayPack subscribers can get the game for £24.49. You can also rent Batman: Arkham City for 3 (£3.99) or 5 days (£5.99). During the OnLive Five Day Frag Feast, anyone who hasn’t yet purchased a game on the service can get their first game for only £1. This means that Batman: Arkham City can be yours for only £1. Batman: Arkham City is an action game published by Warner Bros. Interactive Entertainment. Developed by Rocksteady Studios, Batman: Arkham City builds upon the intense, atmospheric foundation of Batman: Arkham Asylum, sending players soaring into Arkham City, the new maximum security home for all of Gotham City's thugs, gangsters and insane criminal masterminds. Set inside the heavily fortified walls of a sprawling district in the heart of Gotham City, this highly anticipated sequel introduces a brand-new story that draws together a new all-star cast of classic characters and murderous villains from the Batman universe, as well as a vast range of new and enhanced gameplay features to deliver the ultimate experience as the Dark Knight. The OnLive version of Batman: Arkham City already includes the Catwoman DLC Missions. You can play the free demo, rent and buy Batman: Arkham City powered by OnLive. The Lord of the Rings: War in the North is now available for purchase via the OnLive service for members in the United Kingdom. The game carries a price of £29.99, and PlayPack subscribers can purchase it for only £20.99. You can also rent the game for 3 (£3.99) or 5 days (£5.99). During the extended weekend promotion that OnLive is holding, gamers can purchase their first game on the service for only £1. This means that they can acquire this title for just £1. The Lord of the Rings: War in the North is an action RPG published by Warner Bros. Interactive Entertainment and developed by Snowblind Studios. Snowblind Studios is in the unique position of drawing inspiration from both the literary and film rights to the world of Middle-earth, allowing players to bloody their axes on a wide range of deadly enemies and traverse both established and never-before-seen locations. The result is a journey that is both epic and intimate, familiar yet unexpected. While much attention and focus has been placed on the journey of the One Ring, the assault on Middle-earth hits all corners of the map. War in the North turns our attention towards an integral part of the storyline that is grounded in details within the books and various appendices. This is not someone else's fight. This is your own effort to forage a way through the dark, dangerous, and unknown landscape, defending all that is yours. This is your war. You can play a free demo, rent and buy The Lord of the Rings: War in the North powered by OnLive. Google's Chrome browser will soon have greatly enhanced gaming capabilities, with plug-and-play support for gamepads on the way. Due in the first quarter of next year, the update will also see Chrome support cameras and microphones without the need for plug-ins, with Kinlan hinting at the possibilities for augmented reality games and player tracking. It all goes to show the growing potential of Chrome for games. With HTML5 widely accepted to replace Flash in the fullness of time, Chrome's support for accelerated graphics with WebGL, and an unrivalled update cycle - Google releases a new version every six weeks, no matter what - it's certainly got the technology. With over 200 million users - it's expected to replace Mozilla Firefox as the second most popular browser on the planet before the year is out - it also has the audience. The OnLive gifting service is now live for UK users of the gaming service. To Gift someone a gaming package, all you need to do is visit the OnLive Gift Store. You will then be presented with a list of Gift’s that are currently available. Once you have chosen and purchased your Gift, OnLive will then email you a Gift Certificate to print or email to your recipient. Each Gift Certificate has it’s own unique code that can be redeemed. OnLive Game System with shipping included. Gift Code for any Game on the OnLive Game Service. Please note the Gift Code can not be used on Pre-Orders and the Game System can only be delivered to addresses within the United Kingdom. Please note the delivery is limited to addresses within the United Kingdom. The OnLive Thanksgiving Sale has begun! There are over 40 games, reaching up to 75% in savings. (These deals are only available in the US so far.) There is no official set date to when these sales end, although we can only assume it ends on Monday, November 28th along with the Frag Feast. Don’t forget to also activate your 5 FREE days of Homefront and Red Faction: Armageddon! Some of the notable price drops are L.A. Noire for $34.99, Call of Juarez: The Cartel for $37.49, Deus Ex: Human Revolution for $24.99, Orcs Must Die! for $7.49, and dozens more from $5 to $10. Whatever your taste in gaming is, you are sure to find something during this huge Thanksgiving sale. Considering this is just the first out of five days of Frag Feast, OnLive gamers everywhere should be thrilled with the current sales and both curious and excited with the possibility of what’s to come. Sign into the OnLive service. Find Homefront in the Marketplace. Find Red Faction: Armageddon in the Marketplace. To stay up-to-date with the OnLive Frag Feast, you can either check Onlive's Twitter page or OnLive’s Facebook page. You can also check them out at http://www.onlive.com/go/fragfeast for the US and http://www.onlive.co.uk/go/fragfeast for the UK. OnLive will be holding a Five Day Frag Feast promotion over Thanksgiving weekend. Actually, OnLive will be holding several promotions that kick off at 3:59 PM PST/11:59 PM GMT today and run through 12:01 AM PST/8:01 AM GMT on Monday, November 28th. OnLive users can sign into their accounts during these five days, and play Red Faction: Armageddon or Homefront free of charge, the multiplayer modes are of course included, hence the Frag Feast. These are both spectacular games, that no one should miss an opportunity to play. With this promotion, there will surely be no lack of multiplayer gamers to play against. OnLive held a similar promotion for UK gamers during the Eurogamer Expo in September, and then for US gamers a few weeks later. They are doing it again. If they act fast, new OnLive users will be able to get their first OnLive game for only $1 (US) or £1 (UK) (while supplies last). This includes all the hot new releases such as Batman: Arkham City, Saint’s Row: The Third, L.A. Noire and Lord of the Rings: War in the North. This offer does not apply to pre-orders and cannot be combined with other offers. During these five days, OnLive will be holding daily deal sales featuring dozens of titles from OnLive’s comprehensive library of over 175 games, including some of the season’s biggest blockbuster titles, with discounts of up to 75% off their normal prices. The games that will be on sale have yet to be announced. These sales will be announced on OnLive.com and OnLive.co.uk as well as Twitter and Facebook, throughout the weekend. More details will be made available at www.onlive.com/go/fragfeast and www.onlive.co.uk/go/fragfeast, once the promotion goes live. Yesterday, Batman: Arkham City went live for OnLive in the United States. At the same time, a free 30 minute demo of the game became available in both the United States and the United Kingdom. Even though the game won’t officially launch in the UK until tomorrow, gamers still had a chance to try it out for free for 30 minutes, via the OnLive cloud gaming service. Now it appears as though the OnLive demo record has been set in both the United States and the UK. OnLive founder and CEO Steve Perlman was certainly happy to see such a response, although we doubt he was too surprised. Batman: Arkham City is hardly the first AAA title to offer exclusive demos for free on the OnLive service. However, it is one of the most anticipated games that have been released for any platform in some time. For OnLive to have an exclusive demo available almost instantly, without large downloads, or having to acquire a demo disk, certainly makes the service quite appealing to many gamers. This is just one aspect of OnLive that truly makes it unique in a video game industry filled with plenty of competition. You can play the free demo of Batman: Arkham City for the US powered by OnLive. You can play the free demo of Batman: Arkham City for the UK powered by OnLive. You can buy, rent and demo Batman: Arkham City for the US from the OnLive Website. You can buy, rent and demo Batman: Arkham City for the UK from the OnLive Website. Last month, we reported that survival horror game, Afterfall: InSanity would be coming to the OnLive service. While Nicolas Entertainment Group had hoped to release the game for OnLive the same time it was released on other platforms, we all know release dates (especially for OnLive) are never set in stone. However, the game will be released for OnLive on November 25, the same date it will also come to the PC, according to Patryk Hamerlak of Nicolas Entertainment Group. The Playstation 3 and Xbox 360 versions of the game have been delayed until next year. OnLive will also have a 30 minute free demo of Afterfall: InSanity available when the game goes live. This means that gamers will have the opportunity to play as much of the game as they can for 30 minutes, via the OnLive service. While we couldn’t get 100% confirmation that the game will also be released in the UK on the same day as it goes live in the US, it is believed that it will. OnLiveFans had the chance to interview Przemyslaw Bartowiak, a programmer at Intoxicate Studios. They were able to ask him some questions about Intoxicate Studios’ upcoming third person, action, and horror game, Afterfall: InSanity. They also asked Bartowiak about the process of getting the game onto the OnLive service, and what he thought the most compelling reason OnLive has, to convince developers to bring their games to the service. Check out the full interview and Afterfall: InSanity’s super exciting trailer below. Tell us a bit about yourself. What role did you play in creating Afterfall: InSanity? My name is Przemysław Bartkowiak and I’m a programmer with Intoxicate Studios. What is the rest of your dev team like? It’s probably the only of its kind; we’ve managed to gather a young, ambitious and passionate team with many talented game designers, graphic artists, level designers and programmers. As passionate gamers ourselves, whose goal is to make computer games for other players, we are really proud of the work we have done so far. Tell us a bit about the game and a little about the main character from the game. Afterfall: InSanity is a post-apocalyptic horror-genre game, which serves as the player’s introduction to the Afterfall Universe. The protagonist of Afterfall: InSanity, psychiatrist Albert Tokaj, is a member of the medical team which takes care of the mental and physical well-being of citizens living in the shelter. He specializes in the mental disorder that’s affecting the citizens, caused by being locked-up for too long; even he is not free of its symptoms. He will have to face the dangers lurking in the darkness of the shelter and in his own mind, battling with his own weaknesses and fears. What kinds of weapons will we be using in the game? We created a wide variety of weapons, so gamers can choose from an array of shotguns, assault rifles, magnums, submachine guns, and there are also elements of freefighting. To make fighting more exciting we’ve also implemented “fearlock” – a system responsible for representing the influence of fear and adrenalin on the player. What are your personal favorite features of the game? It’s not just a “one-time through” kind of game. The first time through you are so busy with fighting and shooting that you don’t have much time to concentrate on the details of the storyline of the wider Afterfall Universe. The surprising and intriguing end of the game changes your view on the whole storyline, and makes you want to play again, to go back and see if you can spot the hints and clues that you might have missed. My other favorite element is the atmosphere of a post – apocalyptic reality and the advanced freefight mechanics. We drew our inspirations from many sources – we made a huge storyline and backstory supported by thousands of photos of real locations. There are other post-apocalyptic games like Fallout, but we wanted to create a game that takes place in our own backyard. Gamers will recognize easily some old-school elements of Polish reality, which makes this game absolutely unique. What is your favorite feature on the OnLive service? Our favorite feature is that any user can instantly watch other user’s game play, so if I am interested in buying a game I can watch it in action. Additionally, users can vote on other user’s playing style, so there is an opportunity to socialize and engage with players that have similar styles to your own. What made your team want to publish your game on OnLive? OnLive is an extremely important channel to help our company sell the game. But more important is that OnLive makes it easier to play our game. These days people do a lot of traveling and many of them are tired of having to carry around cpu-intensive gamer-level heavy notebooks all the time. With the advent of OnLive, it has the biggest advantage of all time, since only the video signal is transmitted to the user’s computer, so they don’t have to worry about their own hardware anymore. The second thing is antipiracy. As I mentioned before, the OnLive stream is just the video signal, so playing an illegal copy is impossible. Do you plan on bringing future games to the OnLive service? Yes we do. We have finished our current project and we are thinking about the next one, but it’s still very top secret for now. Was it difficult to get your game onto the service and how long did it take? It took two weeks to add it into the Unreal Engine. We achieved it so quickly because we have a great programmer who did the integration. Additionally OnLive documentation is very clear and easy to implement. OnLive also gave us great tools for testing and debugging, to see if we had made any mistakes in our implementation. Here we should also mention that OnLive has some really great people in technical support that quickly helped us get back on track, on the few occasions that we ran into challenges. I think the most compelling reason for publishers to bring their games to OnLive is antipiracy and the ability to free gamers from limitations of their hardware. Any tips for gamers who pick up your game on OnLive this November? Get ready for a stirring storyline, a unique atmosphere of overwhelming fear, anxiety and awe, a lot of spectacular locations in a post-apocalyptic universe, exciting fights and an awesome soundtrack. OnLive partner BT has paid for a Twitter topic of #BTOnlive to be featured as a promoted/trending topic for a while. It looks like the topic is drowning under the public's hatred of BT, rather than the discussion around OnLive. Anyone who wants to join the fray, you're free to do so at #BTOnlive. Earlier this year the Innovation Lab, part of the Experience Department at JWT London began working with Playcast to create a product for TV and computer audiences. Publishers can show off new game releases and display the latest news in the gaming market. Guy de Beer, Chief Executive at Playcast, added: "We provide a media experience which combines the qualities of video games and TV with online streaming and social media. JWT is one of only a handful of creative teams who are able to blend these qualities into an organic user experience with a global application for our European and Asian partners." Playcast’s cloud gaming service is already live in Europe and in use by PayTV platforms around the world. Playcast has support by game publishers like Activision, Warner Bros. Interactive Entertainment, Disney Interactive Studios, Atari, Capcom, Codemasters and THQ. The new Playcast cloud gaming user interface sure looks like it borrowed some things from the OnLive UI, but nonetheless it looks interesting. OnLive could learn something from this new Playcast UI and some new OnLive UI skins would be great. OnLive could also put a design studio to work on some new UI concepts or OnLive CEO Steve Perlman, who used to work at Apple, could ask Apple's design team for a little assistance. Vinnie Reddy, CEO of BlueGiant Interactive has informed OnLiveFans that the game developer is bringing their real-time strategy game, APOX to the OnLive service. While, there is no date set yet for when we will see this game released for OnLive, Reddy said that they have already looked at the OnLive SDK to determine the amount of work needed to bring the game to the service. Reddy also said that they are currently working on another game (Next Iteration), and hope to bring it to OnLive at the same time as APOX. OnLive really doesn’t have any games like this on their service as of yet. There is no word if this game will be sold individually as a PlayPass title, or if it will be included in the OnLive PlayPack. It currently sells for $14.99 on Steam. After a month long delay, Batman: Arkham City finally released on OnLive alongside the PC version of the game. Batman: Arkham City is priced at $49.99 and PlayPack subscribers can get the game for $34.99. You can also rent Batman: Arkham City for 3 ($5.99) or 5 days ($8.99). OnLive UK gamers who wait for Batman: Arkham City to release on friday can in the meantime play the free timed demo of the full Batman: Arkham City game. You can play the free demo of Batman: Arkham City powered by OnLive. You can buy, rent and demo Batman: Arkham City from the OnLive Website. Batman: Arkham City was also nominated for Spike TV Game Of The Year Award and Rocksteady for Studio Of The Year. Spike TV Video Game Awards pay tribute to the outstanding achievements of games, designers, animation, breakthrough technology, music and performances of the past year in the industry. The awards also provide a glimpse at the future of gaming, including exclusive sneak peeks and world premiere footage of some of the most anticipated games from the years to come. Batman: Arkham City is going head to head with many of this year’s hottest video game titles. Game of the Year nominees include: The Elder Scrolls V: Skyrim (Bethesda), The Legend of Zelda: Skyward Sword (Nintendo), Portal 2 (Valve), and Uncharted 3: Drake’s Deception (Sony). Rocksteady Studios, the developer of Batman: Arkham City, was also nominated for Studio of the Year and goes toe to toe with Bethesda Game Studios (Elder Scrolls V: Skyrim), Naughty Dog (Uncharted 3: Drake’s Deception), and Valve (Portal 2). The winners will be announced on December 12th, 2011 so get your picks in as soon as possible! This week's additions to the PlayPack are Fallout: A Post Nuclear Role Playing Game and BloodRayne. These two additions bring the PlayPack to 124 games and counting. Fallout: A Post Nuclear Role Playing Game is a RPG classic from the golden age of PC RPGs. The game is published by Interplay. Set in the aftermath of a world-wide nuclear war, Fallout will challenge you to survive in an unknown and dangerous world. You will take the role of a Vault-dweller, a person who has grown up in a secluded, underground survival Vault. Circumstances arise that force you to go Outside -- to a strange world 80 years after the end of the modern civilization. A world of mutants, radiation, gangs and violence. Your immediate task is to find a replacement for the broken water purification controller chip. Without that chip, your fellow Vault dwellers are doomed to dehydration or be forced to leave the safety of the Vault for the Outside. OnLive has also announced the Three Weeks of Fallout, which means that each weak from now we'll see one new Fallout game in the PlayPack. The other two Fallout games to join the PlayPack are Fallout 2 and Fallout Tactics. Sadly no Fallout 3 or Fallout: New Vegas yet, because those two are published by Bethesda. Let's hope that Interplay also brings more of their games like Earthworm Jim, Freespace, MDK, Sacrifice and Messiah to OnLive. You can play the free demo of Fallout: A Post Nuclear Role Playing Game powered by OnLive. BloodRayne is an action game published by Majesco Entertainment and developed by Terminal Reality. Its successor, BloodRayne 2, is already a part of the OnLive PlayPack. As Agent BloodRayne, you'll travel through the eerie swamps of Louisiana, to Argentina and Germany in this battle-heavy, 3rd person thriller. Being the half-vampire BloodRayne, you have sworn your life to protect humanity from the supernatural. Your latest assignment: Seek and destroy the nefarious vampire Jurgen Wolf before he can use powerful occult relics to unleash untold horror upon the world. Slaughter, dismember, and behead devious enemies that seek reinforcements and plan ambushes. Acquire supernatural skills and master brutal weaponry as you progress. BloodRayne is a pulse-pounding thrillride that gets you by the jugular and won't let go until it's over. You can play the free demo of BloodRayne powered by OnLive.